VietPress USA (April 13, 2018): One year ago, on Thursday 4/06/2017, President Trump ordered to launch 59 Tomahawk missiles to destroy 60% of Shayrat air base near Homs where Bashar al-Assad’s military airplanes took-off to use chemical weapons for attacking and killing Syrian civilians in the rebel-held area in Tuesday night on April 4, 2017. Last Saturday, 4/07/2018, Syrian President Bashar al-Assad used chemical weapon to kill dozens of Syrian civilians in Douma outside Damascus and killed at least 40 children and women, injured hundreds others. On Wednesday 4/11/2018, President Donald Trump official warns Russia that he will direct an air strike at Syria in response to last week’s chemical attack and chastising the Kremlin for its support of Syrian President Bashar Assad. On April 12, 2018, French President Emmanuel Macron declared that France has proof of chemical weapons that al-Assad used to kill Syrian civilians last week and will work closely with USA for response. Today, on Friday, April 13, 2018, President Trump said he already ordered precision missile strikes against the regime of Syrian dictator Bashar Assad Friday night in a coordinated attack with U.K. and French allies. Gen. Joseph Dunford, the chairman of the Joint Chiefs of Staff, said the three targets were a scientific research center near Damascus, a chemical weapons storage facility west of Homs and a storage facility and command post near Homs. 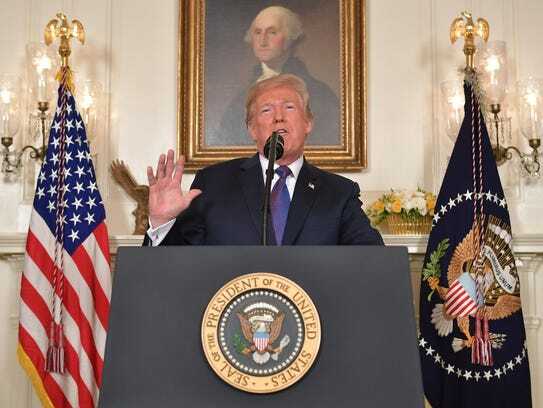 WASHINGTON — President Trump said he ordered precision missile strikes against the regime of Syrian dictator Bashar Assad Friday night in a coordinated attack with U.K. and French allies. 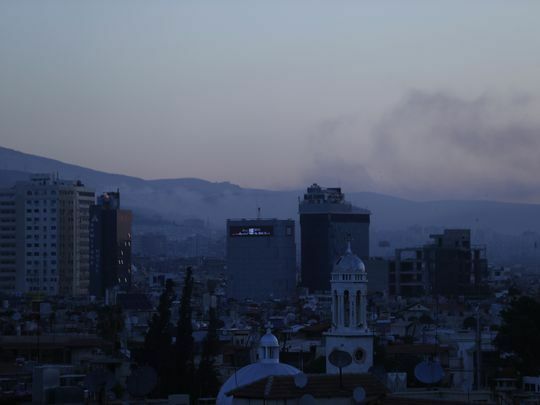 A thundering series of at least six explosions rumbled across Damascus as smoke filled the air, a witness told Reuters. Another witness told the news agency the Barzah district of the city — the location of a major scientific research center — has been rocked by the strikes. Smoke rising from the east part of the city had turned the sky orange, according to Associated Press reporters, and fires were erupting nearby. After the attack stopped and the skies darkened again, nationalist songs blared from loudspeakers mounted on vehicles crossing the streets. Syrian state TV said the army’s air defenses were responding to the attack. 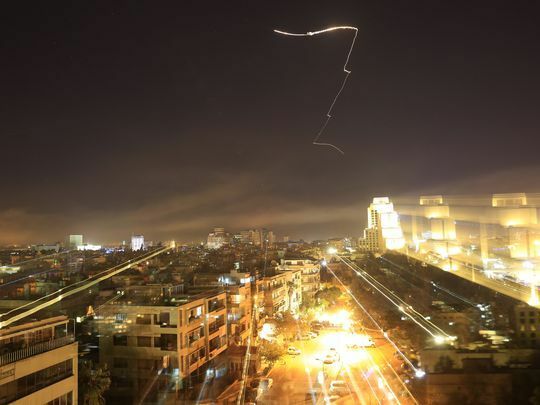 Air defenses hit 13 rockets south of Damascus, Syrian media reported. The action comes almost a week after rebels in the beleaguered nation claimed Syrian forces under Assad killed more than 40 men, women and children in a chemical weapons attack in the Damascus suburb of Douma. "The evil and the despicable attack left mothers and fathers, infants and children writhing in pain and gasping for air," Trump said in a hastily arranged, eight-minute nationally televised address at 9:01 p.m.
Dunford said there were no early reports of U.S. losses, although there were some surface-to-air missiles shot by Syrian defense forces once the missile attack started. Syria has denied using chemical weapons. The Organization for the Prohibition of Chemical Weapons was scheduled to begin its own investigation in Syria on Saturday. But Friday night, the White House released what it said was "a significant body of information" that pointed to the use of chlorine gas — and possibly also the deadly nerve agent sarin. That evidence includes victim statements, images of barrel bomb fragments, and reliable reports of Syrian government helicopters in the area. Trump, in the days after the attack, described the Syrian president as "that animal Assad" and ripped Russia and Iran for supporting him. Trump was further agitated when a Russian official promised that U.S. missiles would be shot down and the base or ships from which they were fired attacked. "To Iran and to Russia, I ask: What kind of a nation wants to be associated with the mass murder of men, women and children?" Trump said. He accused Russian President Vladimir Putin of reneging on a 2013 promise to ensure that Assad would discontinue his chemical weapons program. "Russia must decide if it will continue down this dark path or if it will join with civilized nations as a force for stability and peace," he said. "Hopefully someday we'll get along with Russia, and maybe even Iran, but maybe not." "The United States has an important national interest in averting a worsening humanitarian catastrophe in Syria, and specifically deterring the use and proliferation of chemical weapons," he said. Vice President Pence notified congressional leaders of the attack less than 30 minutes before Trump went on television. Pence, who is in Peru to fill in for Trump at the Summit of the Americas, left a summit ceremony early in order to make the calls by a secure line from his hotel, said Pence deputy chief of staff Jarrod Agen. Trump had telegraphed the attack in a series of statements and tweets throughout the week. "Russia vows to shoot down any and all missiles fired at Syria," Trump responded on Twitter. "Get ready Russia, because they will be coming, nice and new and 'smart!' You shouldn’t be partners with a Gas Killing Animal who kills his people and enjoys it!" On Thursday, however, Trump walked his remarks back a bit, saying an attack "could be very soon or not so soon at all!" Mattis on Thursday repeated a common theme of the Trump administration: The U.S. goal in Syria is to defeat of the Islamic State while avoiding involvement in the brutal, seven-year civil war that has killed hundreds of thousands of people and driven millions from their homes. However, on Thursday afternoon, British Prime Minister Theresa May released a statement saying her government "agreed on the need to take action to alleviate humanitarian distress and to deter the further use of chemical weapons by the Assad regime." The British, the statement said, will keep working with the United States and France to determine an international response. On Saturday morning in London, May issued another statement, saying, "This is the first time as Prime Minister that I have had to take the decision to commit our armed forces in combat and it is not a decision I have taken lightly. "I have done so because I judge this action to be in Britain’s national interest," May said. 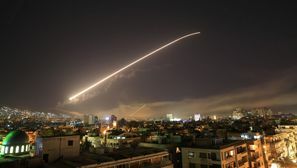 The strategic aim of the U.S. response, a former senior Defense official familiar with planning for the attack said, was to raise the cost of using weapons prohibited by international treaty and doubts in the minds of Assad's military officers the next time he orders a similar attack. The former official spoke on condition of anonymity, lacking authorization to speak publicly about planning. Assad has repeatedly been accused of using chemical agents during the nation's devastating, seven-year civil war. A sarin gas attack a year ago killed more than 80 people in the town of Khan Shaykhun, and two days later Trump authorized launch of dozens of cruise missiles on a Syrian air base. British and French forces had been expected to take part in the latest allied effort, including use of missiles. The use of allied, manned warplanes would require first destroying some of Syria’s air defenses, which include Russian-made S-400 surface-to-air missiles. Those systems encircle Damascus and some of Syria’s larger bases. Less than a month ago, Trump said he wanted to bring U.S troops home from Syria. The White House, however, quickly signaled a U.S. withdrawal is not imminent. Still, Sen. John McCain, R-Ariz., chairman of the Senate Armed Service Committee, said Trump's "premature" declaration emboldened Assad. On Friday, Trump said he remained committed to having other countries step up in the region so that U.S. troops can come home after defeating the Islamic State. "America does not seek an indefinite presence in Syria. Under no circumstances," he said. "We look forward to the day we can bring our warriors home, and great warriors they are."